Posted 2nd July 2015 & filed under Blog, Education, Intergenerational Justice. September 2012 marked both the introduction of the new £9,000 tuition fees and my first year of university. Despite strong resistance from politicians and students alike, fees were controversially tripled by the newly elected coalition government, despite the Liberal Democrats previously winning over voters by pledging to abolish them completely. This annual tuition fee, together with living costs of £5,740, means that for full-time students from England and Wales, a three-year course at university will rack up a debt of £44,220. For a student like me studying in London, this can be as much as £51,027. The government assured prospective students that this rise in fees wouldn’t be a barrier to their studies, and devised a student loan system to match the costs. The attraction of the system is supposed to lie in its dependence on the financial situation of the student, from the amount of money to which they are entitled, to how much they pay back and when. So how is this system supposed to sweeten the pill of a £45,000 graduate debt? Firstly, a repayment threshold means that currently students do not need to start repaying until their annual income is over the threshold of £21,000 a year. Above this amount, students pay back 9% of any amount earned. The second measure designed to soften the blow of inflated tuition fees is a 30 year “write off” plan: if the debt has not been repaid in 30 years from the April after the course ends (when students are due to start repaying), it can be written off. The coalition government was well aware that many graduates would never actually earn enough to repay before the 30 year limit, with recent figures estimating that 73% of students will never pay back their whole loan. These are certainly welcome features of the current student loan system. In light of these measures, Martin Lewis (the founder of moneysavingexpert.com) has described the university process as “no win, no fee”. That is, if you graduate from university and do not earn enough to repay your debt within 30 years, then you are not obligated to “reimburse” the university for the education you have received. However, there are other significant features of the system which are not so attractive – in particular, the interest rate that students are charged on their loan. For students in England and Wales after 2012, the interest rate stands at RPI (rate of inflation) + 3%, which amounts to 5.5% currently. 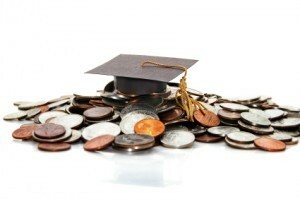 An interest rate this high makes it far more difficult for a student to pay back their debt. Despite the consolation of a recent fall in the rate of inflation to 0.9% , meaning the interest rate is likely to drop to 3.9% from this coming September, a significant clause in the terms and conditions of the loan agreement states that the government is entitled at any time to change the conditions for repayment: the first page reads that the following regulations “may be replaced by later regulations”. This clause means that the government can, at will, lower or freeze the income threshold, or eliminate it altogether. They are also free to raise tuition fees, which was a contentious topic during the recent General Election. Indeed, such changes have already occurred – some for the better and some for the worse. For instance, the threshold for repayment was increased from £15,000 when the new fees were introduced to the new sum of £21,000. A less favourable change was a 4% increase in the interest rate. Given both the high interest rate and the prospect of changes to the loan agreement, perhaps the biggest crutch for less wealthy students entering higher education is the availability of a maintenance grant. Crucially, the maintenance grant does not have to be repaid, and so can help significantly towards accommodation and other living costs. The amount depends on your family’s – or “household’s” – annual income, and reduces the size of the maintenance loan. As it stands, students with a household income below £42,620 are entitled to a grant; an income of £25,000 or less secures the maximum £3,387 per year, and lower amounts are calculated on a tapering scale for higher incomes. The existence of these grants has been a significant contributor to the lack of decline in university applications since fees were increased. In fact, since 2006, entry rates to universities for poorer students have risen by 61%. Being entitled to a maintenance grant means that – somewhat counter-intuitively – it seems poorer students from England and Wales are more likely to attend university than poorer students in Scotland, where tuition fees are non-existent – since, the Scottish system provides little in the way of grants. Yet a recent BBC report reveals there have been talks of worrying plans to phase out these grants in a bid to make savings. As a recipient of the grant, I know how important it was, especially to contribute towards expensive London rent in my second and third years. The maintenance grants are also psychologically beneficial: the security of having a set amount of money coming in every year provides a good counterpart to the relatively volatile and uncertain loan system, which can be changed at any time. So if the security of maintenance grants was to be withdrawn or drastically cut back, this would need to be accompanied by an increased awareness among students about their loan agreements. As it stands, few students know even the basic details of this agreement, such as the interest rate they will be charged. I asked 20 undergraduates in their final year at university, from a variety of courses, whether they know the interest rate on their student loan. Out of those 20, only 3 students knew the 5.5% rate, and for the other 17, guesses ranged between 1% and 3%. The vast majority of the 20 knew the repayment income threshold of £21,000, but on the whole it was clear that even students for whom repayment is an imminent prospect have a severe lack of understanding about the financial agreement they entered into three years before. Perhaps this is unsurprising. After all, there is only one available option for taking a student loan. There is no need to shop around loan companies, and no “compare the market” website to decide which plan to opt for. There also seems to be a sense of safety in numbers: students rely on the fact that everyone else is agreeing to the same set of terms and conditions, and so the prospect of being misled or exploited appears less threatening. Despite this perceived safety, there is an almost general consensus among students that the tuition fees system is, at least in some respects, unjust. For me, this sense of unfairness goes far beyond merely feeling unlucky that I started university in the first year of the newly raised fees, or a feeling of resentment towards the Liberal Democrats for their broken promise to scrap fees. Rather, there seems to be something deeply wrong with a system which saddles newly graduated students with a 30-year commitment to a contract that is based on shifting ground – and which they know worryingly little about. Student debt is a psychological as well as a financial burden. The weight that students are forced to carry for 30 years is not something that can be argued away as a “graduate income tax”. The high interest rate and changeable nature of the loan agreement seems to tap into a general trend in policy of taking advantage of a young demographic who are both financially inexperienced, and also increasingly lacking in choice. So the “no-win, no-fee” description of university strikes me as misleading. If we understand the impact of student debt to extend beyond a merely financial strain, it seems that, with the current system, even the “winners” stand to lose out in some way.